I’m certainly no connoisseur of straight gospel music, but the styles of secular singing that were based on gospel forms are the only ones that count. And I can recognise a gospel quartet trying their hand at the devil‘s music – like here. Many of the groups dipping their toes in the water used pseudonyms both to avoid antagonising their existing fan base and to escape any awkward contractual issues. So the Experts may have been famous in the sanctified world or they may have just been a local church group trying their luck, but they sure can sing. Check out the lead singer's impassioned wailing! 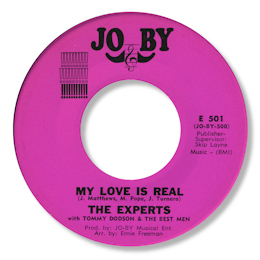 A look at the label for the Jo-By 45 includes the phrase "with Tommy Dodson and the Best Men". Now it could be that Dodson is the pianist here and his group the backing band - or he could indeed be the featured vocalist. Dodson made some excellent solo recordings as well, notably on his own Mainsound label and on Skylark. 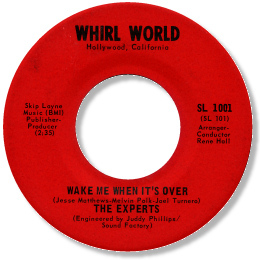 Veteran arranger Rene Hall placed the groups voices in a bluesy setting on this track, just right for the doom laden lyrics. The whole sound is deep soul magic. Thanks to Michel, Greg Burgess and Takumi Kitamura for extra info.